Steamlining the dairy operation and giving you the information you need to succeed: The Dairymaster Milk Manager is a powerful parlour management solution which controls and communicates with automation to provide you with instant parlor information whenever you need it. 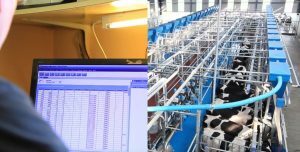 During the entire milking process our management software controls and monitors each individual cow as she is being milked. Milk yields, milking durations and flow rates are among the vast analytical data which are captured and stored during each milking.